Enjoy this content? Please sign up to be notified of future reports and briefings. 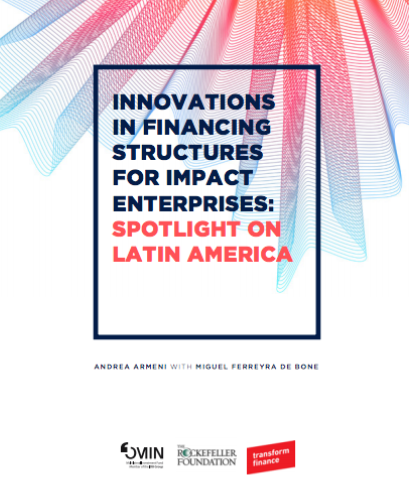 We are pleased to share with you our latest report, Innovations in Financing Structures for Impact Enterprises: Spotlight on Latin America. This report, commissioned by the Multilateral Investment Fund of the Inter-American Development Bank with the support of the Rockefeller Foundation, highlights how traditional debt and equity financing structures often fail to adequately meet the needs of early-stage impact enterprises. The report examines the pain points for both investors and entrepreneurs around traditional structures and the need for innovative instruments, provides examples of emerging and proven models, from revenue-based mezzanine debt to self-liquidating equity, and offers suggestions for concrete steps to advance the adoption of alternative structures to foster impact enterprises. Through 16 case studies from throughout Latin America, we aim to offer an overview of innovations both at the deal level and at the capital aggregation level, where holding companies and open-ended funds have proven to be potentially well suited for this space. This report is based on input from experts and pioneers through over 40 interviews, multiple workshops and international roundtables, encompassing the views of fund managers, asset owners, entrepreneurs, and field builders. It does not aim to be a definitive guide to the topic: rather, it is meant as a starting point for further discussion and collaboration in the field. As such, we welcome all comments on the report as well as on potential next steps to continue supporting the development of the field. Please reach out to info@transformfinance.org; we look forward to hearing from you.